(by Tom Leonard, Telegraph.co.uk) – A … New York newspaper has been accused of racism over a cartoon comparing the administration of Barack Obama to a mad chimpanzee. The cartoon in Wednesday’s edition of the tabloid New York Post, which is owned by Rupert Murdoch, links two prominent US news stories – controversy over Mr Obama’s economic stimulus proposals and a recent incident in which Connecticut police had to shoot dead a pet chimp that went berserk and mauled a woman. In the cartoon, drawn by Sean Delonas, a regular Post cartoonist, two officers are staring gloomily at the blood spattered chimp’s corpse after one of them has shot it. 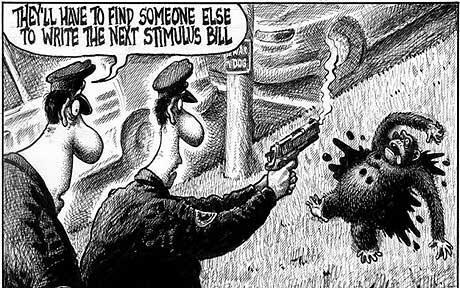 “They’ll have to find someone else to write the next stimulus bill,” says the other officer. In a statement, Mr Sharpton said the cartoon was “troubling at best given the historic racist attacks of African-Americans as being synonymous with monkeys”. He said that it could be asked whether the cartoonist was “making a less than casual reference to this” and could be “inferring that a monkey wrote the last bill”. David Patterson, the black governor of New York state, later joined Mr Sharpton in asking for an “explanation” from the newspaper. Col Allan, editor-in-chief of the Post, said: “The cartoon is a clear parody of a current news event, to wit the shooting of a violent chimpanzee in Connecticut. “It broadly mocks Washington’s efforts to revive the economy. 3. What is the cartoon a parody of, according to Post editor Col Allan? 4. Do you think the cartoonist was portraying President Obama as the chimp in the cartoon? 5. a) Do you think the cartoonist is racist? b) If you had seen this cartoon before hearing the accusation that it was racist, would you have thought that the cartoonist was portraying President Obama as the chimp? Explain your answer. Read “How Laws are Made” at bensguide.gpo.gov/3-5/lawmaking/example.html.